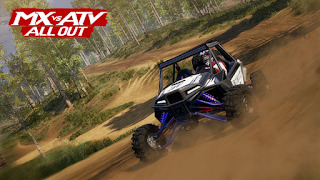 Rainbow Studios has announced today, Monday, May 14 that SLASH and Nicholas O’Toole have co-written the new theme song for the popular off-road racing video game MX vs ATV All Out. SLASH and Nicholas previously composed the score to SLASH’s first ever horror film titled Nothing Left To Fear, and re-teamed to create the track “Vanishing Point” for the action-packed game. Watch the gameplay trailer and hear the track HERE. SLASH, the iconic American rock guitarist, songwriter and film producer-has amassed album sales of over 100 million copies, garnered a GRAMMY Award, and seven GRAMMY nominations and was inducted into the Rock and Roll Hall of Fame. MX vs ATV All Out invites players of all skill levels to do it all--explore massive environments, compete in the best series events, ride freestyle and pull off insane stunts! All the bikes, tracks, gear, music, riders, personalities and even UTV’s are packed in! MX vs ATV All Out is available now for $49.99 on consoles and $39.99 on PC.